After hiking up Knockniny hill with a lovely sun setting to the west, we gather ’round a roaring bonfire as event organizer, Jim Ledwith calls out instructions to the straw boys and mummer volunteers wearing costumes this year. It is an ancient tradition that has been revived here on Knockninny Hill crowned by a Bronze Age cairn and atop a prehistoric cave. Plaited rings of straw are thrown onto the fire in honor of the sun and handfuls of seed scattered over the flames to invoke new life, fertility and bounty. 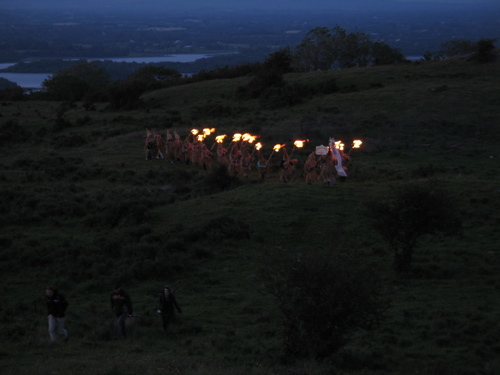 Bread is held over the fire by the Wren, a young girl dressed in a brown fringed costume and then distributed as the strawboys jump the flames of the bonfire. Young women are warned…..touch the white horse (a symbol of fertility) and……wait for the baby to pop out! 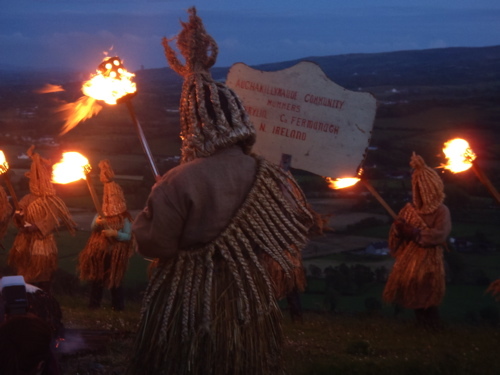 Learn more about the Aughakillymaude Community Mummers here. Thanks Louise, it was really fun. Good craic too with mugs of tea and the best raisin bread afterwards at the community hall and mummers museum.